Jim McCorry is expected to remain on as Down football manager despite only narrowly winning the backing of Down officials at a vote on Monday night. Delegates were reported to have backed Armagh man McCorry to remain in charge on a 22-20 vote. The Irish News has reported that McCorry is set to remain on although he has been unavailable for comment. McCorry, in his first year in charge, led Down to Football League promotion but they had a poor championship. 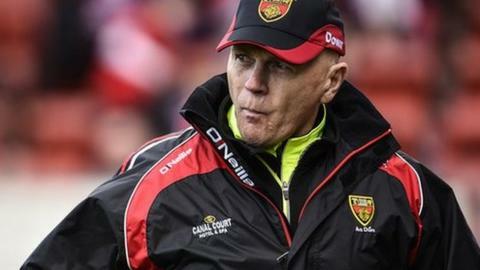 The Mourne County were edged out by a point by Derry in an Ulster Championship game they could and probably should have won. Down then exited the All-Ireland qualifiers in very disappointing fashion when they were beaten 2-16 to 2-11 by a Wexford team who had suffered relegation to Division 4 of the Football League during the Spring. McCorry is expected to hold further discussions with the Down GAA board but the expectation is that he will remain in charge despite the less than fulsome backing from a large section of officialdom within the county.